As I've talked about in previous columns, my heavy metal origins only date back to the early 90s. Sure, I had heard some songs here and there in the 80s but nothing that truly grabbed me until the 1992/1993 period of time. The first big acquisitions for me were Metallica's 'And Justice for All' and 'The Black Album', provoked into purchase by my student peers. After hearing a song entitled "Angry Again" in my friend's car...my curiosity was peaked. "Angry Again" was a meaner, aggressive track with a charismatic voice that I didn't know. Asking what it was, my buddy just said it is a "Last Action Hero" movie song. I had no idea what that even meant. Later, I realized it was an Arnold action flick and "Angry Again" was a track on the film soundtrack. Band--MEGADETH. I was intrigued. I hit a local CD store to find more about this Megadeth act and was blown away to see so many albums. With just enough pocket money to buy a $5 or $6 used CD, the only thing in my price range was a used copy of "Countdown to Extinction". Flipping it over and seeing it was the newest, I snagged it. If my childhood had a soundtrack it would be this album. Megadeth was MY BAND. It's hard to dispute the idea that Megadeth was on top of the mountain in 1992. The group's prior effort, 1990's 'Rust in Peace', conceived what many think to be the band's best lineup--Mustaine/Ellefson/Friedman/Menza. In 1994, that album was certified platinum. 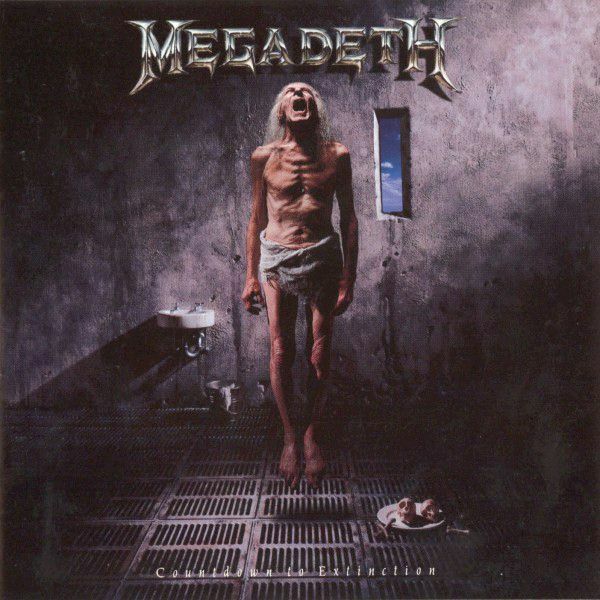 But for "Countdown to Extinction", the more focused, straight-forward thrash sound prevailed, an improvement on the group's "Rust" blueprint and a more experienced, albeit reckless, band emerged. Certified 3x platinum, the record debuted at number two on Billboard and was nominated for a Grammy in 1993 (losing to Nine Inch Nails). If "War Pigs" was a precursor to the audio apocalypse, "Ashes in Your Mouth" is certainly Hell's main event. The battery of drums/stacatto rhythm leading into the big blocks of thrash groove is massive in its development. Mustaine's doomsday proclamation is "The end is finally here, God have mercy". It's bold, technically perfect--it's commercial thrash produced with a modern vengeance. The embodiment of utter devastation courtesy of Max Norman. And it works. There's so many tracks that Megadeth enthusiasts and heavy metal historians can point to as "classic". "Symphony of Destruction" is the so-called hit of the record, leading to numerous covers and remixes (one by Trent Reznor). But it's the teen angst of the album that pushes it to sonic superiority--"Skin O' My Teeth", "This Was My Life", "High Speed Dirt" and the psycho interplay of "Sweating Bullets". It's all rebellion channeled through musical aggression. On "Captive Honour", we hear the charismatic (read venomous) spoken voice of Mustaine asking, "LIFE? What doyamean life? I ain't gotta life". It's spoken like a hardened criminal, as if Cape Fear's Max Cady replaces Mustaine on vocal duties. Other times the album speaks to current events--"Foreclosure of a Dream" about bankrupt farmers (spawned by Ellefson's family) and the album's title track looking at animal captivity and slaughter. Or, like many of Megadeth's themes--War. Brutal, unending, senseless war, questioned poetically with "Ashes in Your Mouth" and "Architecture of Aggression", the latter's lyrics stating "Great nations built from the bones of the dead".